The way you can squeeze every bit out of the tube…these days there are quite a few condiments in tubes that look a lot like toothpaste. Whatever you call it – the “toothpaste winder” or the “tube squeezer”, you can use it for the condiments just like you would on a tube of toothpaste! Frugal, anyone?!? For more tips and tidbits like these you can subscribe to Lula’s Blog here. So, for lots of us (and the grocery stores) fish is in store for the next few weeks – and I want to give you a helpful tip to keep your at home fish from being tough and dry. Fish (any kind) contains ALOT of water and has a very loose protein structure that makes cooking fish a delicate process. You just don’t want to over cook fish, because fish, more than any other protein, has dramatic “carry-over” cooking. What is carry over cooking? Well…you follow instructions when roasting meet to “let it rest” to re-absorb juices, right? Well, it’s also finishing the cooking process right there on the counter. That’s why most cookbooks/instructions tell you that medium rare is 130 degress…but they tell you to pull your meat from the heat at 125 degrees. I love Rhubarb. Every year I make a big batch of Raspberry Rhubarb Preserves and use it in various applications till it’s all gone (usually end of summer). Sometimes though, I run across Green Rhubarb, and because I use it in savory applications as well, I researched a bit about this “twin” (think of it as a fraternal twin) – it only lacks the anthocyanin pigments which gives certain rhubarb its red hue. This pigment is flavorless so there’s no difference in taste between red and green rhubarb (sour!!). …AND I’ll say it again…DANGER WILL ROBINSON!! Do not try to cook the leaves or eat them raw – they are not innocuous like beet greens – they are poisonous to the point of DEATH!!! If you’d like occasional tips, fun facts and cooking info click here! Lula will be foraging in the Red River Gorge this weekend for these lovely delicacies…a bit early but hey! we’ve got Global Warming!! Ramps are also called Wild Leek, Wild Garlic, and/or Ramson, and are a member of the onion family that sprouts in early spring in woodlands all over the world. Bulbs AND leaves can be used raw or cooked. To me, they are reminiscent of a blend of chive and garlic. Yummy!! So…you’ll be finding them all over fun menus where creative chefs dwell – and you won’t need to ask “what’s this?! ?” – Lula has already educated you!! For more fun tips like this one, subscribe to my blog here . Happy Valentine’s Day! Is Cabbage the New Kale? Cabbage’s reputation has been transformed from peasant fare to superfood. It’s the new kale. With the “fermentation rage” going on, I thought it might be a great time to prime you on the varieties of cabbage. If you believe everything you read about the health benefits of this brassica, you should be eating it every day. For a start, it’s high in vitamins A, B, C and K, full of fiber, iron and potassium and said to have cancer-preventing benefits. If that isn’t enough, it ranks as the vegetable with the fewest amount of calories or fat (at a mere 25 calories per 3.5 ounces.) Oh, and it’s cheap. Cabbage is extremely versatile. You can use it in stir fries, sautés and braises, with meat, poultry, fish or all on its own — think corned beef, sauerkraut, kimchi, coleslaw, soups, braises, raw, pickled and more. You can find Lula’s tasty, beautiful appetizer (above) Brown Sugar Rubbed Pork Loin on Black Bread with Braised Cabbage and Apples here. You can stuff cabbage leaves or use them raw as a natural container for sautéed vegetables or meat. Green Cabbage – Green cabbage is the most basic and common of cabbages. Use it in salads and slaws, stir-fry it, or slow-cook it in soups and stews to bring out its essential sweet nature. Look for heads that feel heavy for their size (which can range from softball to almost basketball size,) with tightly packed, moist looking leaves. Green cabbage can be used raw in slaws and salads and holds up to all kinds of assertive, strong flavors. Red Cabbage – Red cabbage looks like green cabbage except, well, it’s red. Red cabbage heads tend to be a bit smaller than the green ones but look for tightly packed, moist-looking leaves and heads that feel heavy. Red cabbage is delicious thinly sliced in salads like slaws or can easily be cooked. The rich color of red cabbage offers a concentration of anthocyanin polyphenols, as well as antioxidants and contain anti-inflammatory properties. The only downside to red cabbage is that it can turns an odd blue color when cooked. Add vinegar or a touch of lemon juice when cooking to avoid blue food! Savoy Cabbage – Savoy cabbage is also known as curly cabbage. With ruffled, lacy, deeply ridged leaves, these cabbages are gorgeous and tasty. The tender leaves tend to be more loosely layered and less tightly packed than green or red cabbage, although it can be used in much the same way — raw in salads, stir-fried, braised or added to soups and stews. Because the leaves are so tender you can use this cabbage a wrap for rice dishes or stir fried meat. Napa Cabbage – Napa cabbage, also called Chinese cabbage or celery cabbage, has a different look than other cabbages. It has long light-green leaves and white stalks that appears more lettuce-like with a mild flavor that has a bit of a spicy, almost peppery kick at the end. Great for pickles, kimchi, stir fries and salads. Bok Choy – Bok choy has a mild flavor most often used in stir fries, but is delicious braised and used in simple preparations. The cabbage flavor is subtle. No matter what type you buy, look for cabbage heads that are firm, shiny, feel heavy for their size and, except for Napa cabbage, have tightly packed leaves. While you don’t want bruised or beaten-up vegetables, you can peel off and discard the outer leaves, so they need not be pristine. Cabbage will keep best refrigerated, and will last several weeks. If you insert cabbage into your diet on a regular basis, the “rumble in your tummy” will dissipate in only a few days and the nutrition is worth it! 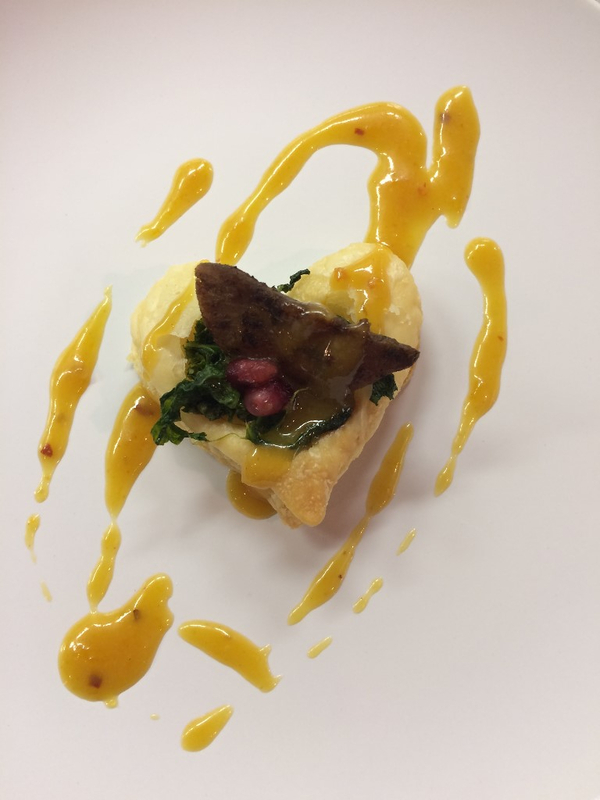 A Valentine’s (or any other amour) appetizer – our Heart’s Afire 5-Spice Quail Breast in Puff Pastry with Wilted Winter Greens and Apricot Mustard. Next time you order iced tea and the waitress asks, “With Lemon?” do yourself a favor and say yes. If you make iced tea at home, a slice of orange will do almost the same good as the lemon, with a slice of lime coming in third. Researches at Purdue University say adding the citrus slice helps you absorb far more of the antioxidants in tea, whether it’s green tea or black. Citrus fruit is wonderful for you in many ways. Lula’s for Lunch… and More! Catering incorporates citrus fruit into MANY of our dishes, sometimes overtly, and sometimes you’ll never even know it’s there! We all love pancakes, right? My favorite are extra fluffy melt in your mouth on the inside and crispy (slightly overdone!) on the outside…Lula’s for Lunch…and More! Catering’s pancakes are called “Crepey Cakes” because they’re so light and dreamy like a crepe, but with more “heft” – we use whole grains in our batter. It doesn’t matter whether you like whole grains, make your own, or they come from a box – a couple of tips to always insure your pancakes aren’t doughy and leaden: 1) Pour your liquids in first and mix them up. 2) whatever liquid your recipe calls for, add 1/4 more liquid (milk or water) – so, if you’re making pancakes for 4, and your recipe calls for 1 cup milk, ad 1 1/4 cups milk. 3) Scatter your dry ingredients over the liquid and using a fork or a whisk, not a spoon, lightly fold stuff toge ther til incorporated but some lumps remain. Pancake batter is in effect a “dough” and you don’t want to activate the gluten too much or they’ll become tough. 4) and probably most importantly, let your batter REST for 10-15 minutes before you dribble it into the pan. Don’t stir your batter to get it into the pan. We’re (me and all the people in my head) happy to answer any questions you may have about your batter – email them under “Ask/About Lula’ on the website www.lulasforlunch.com Have a satisfying breakfast! Or brunch, lunch, dinner…I LOVE pancakes for dinner!! Monosodium Glutamate got lots of attention starting in the 60’s, when “Chinese Restaurant Syndrome” was researched and MSG was named the culprit. Some, but not all people don’t react well to MSG, even though it is a naturally occurring substance in our bodies (with the largest concentration of it in our nervous system). MSG is the sodium salt of Glutamic Acid, and it naturally occurs in mushrooms, seaweed, and wheat gluten, as well. Most manufacturers and restaurants are msg (added) “free” these days…but it is NOT reason for a hissy fit if you feel like your sinuses are swelling or you start sneezing and you find out that something you ate contained a little bit of MSG, or had naturally occurring MSG in it. In fact, salt and sugar are WAY more dangerous for you than MSG. Chances are, you’ve been consuming naturally occurring msg your whole life and have never felt a thing! Lula’s for Lunch…and More! Catering does not add MSG to anything we make, but we do love our mushrooms, our seaweed, and our bread. 🙂 Please enjoy this pic of our Boudin Stuffed Mushrooms above! Do You Have ANY Willpower?!? In my house there’s very little danger of chips of any kind going stale…but just in case you have more willpower than I do, did you know…storing potato chips in the refrigerator keeps them fresher longer?!?!?! Refrigerators are a low moisture environment so there’s simply less moisture for the chips to absorb than pantry air. Potato chips are high in starch content and when starch molecules cool they crystalize to become firm. If you like handy-dandy tips like these about once a week from Lula’s Catering you can subscribe here and we’ll just keep you brimming with food knowledge!! !